A blogger friend sounds a pessimistic note: ‘Our countrymen are maybe more blatant about it than most, but there is no “true” history anywhere in the world. It’s all air-brushed, covered with pancake makeup, and then dipped into rosewater.’ He suggests that these history wars are just a form of dialectic struggle, perhaps a healthy one at that. No, I am not the blogger friend. I missed the chance to discuss the piece before it was published. In any case, I agree with both Naeem’s general thesis, and the particular statement by our mutual blogger friend. It’s just that thinking about the dialectic makes me even more depressed our intellectual poverty. I am not depressed about the lack of “true” history. I went to university in the 1990s, and have enough post-modernism drilled into me to accept that. I know there is no nation, that it’s all imagination. Changes in power relations today will lead to a re-imagination of yesterday — happens everywhere, I get it. For example, after coming to power in New Delhi in 1998, BJP did two things — detonate a bomb, and establish whole bunch of bodies to re-examine (read: rewrite) Indian history. Indian history, as imagined by ‘secular nationalists’ from Pundit Nehru (or going back to Tagore or earlier), held that India in its ‘teeming multitudes’ emerged from various peoples immersing themselves into the Indian nation. For that histiography, Muslims who came from the west of Khyber were ‘part of the nation’ but British were not — the former drank the Indian kool aid, the latter didn’t. The ‘Hindutva nationalists’ saw things differently. They believed that Muslim kings were also foreign invaders, just like the British. That re-imagination led to questions about the origin of Hinduism. Did ideas associated with Hinduism come from beyond Khyber, with the Scythians, Huns, and other ‘Aryans’? Or were they by and large indigenous development? The answer matters to the politics of Indian nationalism. The secular nationalists are fine with an ‘Aryan invasion’ story — they all became Indian eventually. Not so simple though for the Hindutva types, who has a hard time reconciling an Aryan invasion with the ‘Hindus are Indians, Muslims are foreigners’ line. I am simplifying a lot. I need to. There is a huge literature on this, and I am not capable of summarising it beyond the caricature in the above para. But I don’t need to take a position on the historiography of Indian nationalism. My point is that there are history wars in India, and what the layperson learns depends on who’s in power. And this dialectics matter. Whether Indian people choose to accept the Hindutva vision of their country matters. Whether through the dialectics, the Hindutva vision morphs into something else, that would matter too. Immensely. Self-evidently. What depresses me isn’t the dialectics itself. If our dialectics was about fundamental differences in how we conceive Bangladeshi society and politics, that would be one thing. In fact, that would be a great thing. But that’s not what we have though. Instead, we have a dialectics about personalities. Once upon a time, our governments and their pet intellectuals tried to downplay Sheikh Mujibur Rahman’s role in history. 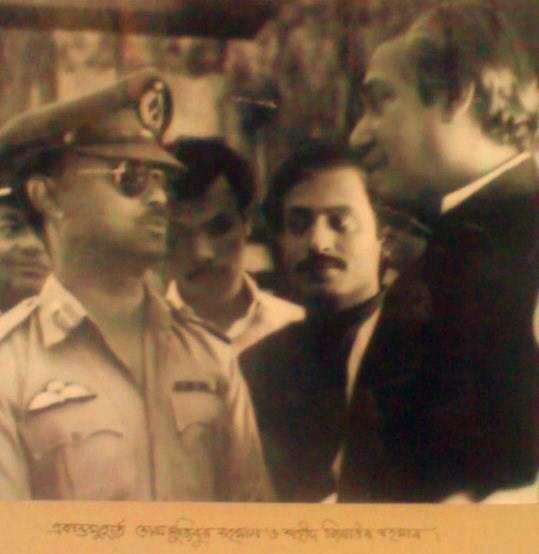 To give him his due as the founder of Bangladesh would have meant the people in power taking on Mujib’s killers — something even a self-assured man as Ziaur Rahman didn’t do. And these days we have a government and its pet intellectuals trying to build a cult of personality around Sheikh Mujib as if he was the Sun King. So our dialectics isn’t about these dead men’s ideas, but about the men themselves. How pathetic is that? The Awami League, or its intellectual supporters, cannot conceive a historiography around the Mujibist ‘high ideals’. They don’t want to talk about Bengali nationalism or secularism or democracy or socialism. If ‘Sheikh Mujib is the greatest Bengali ever’ isn’t sufficient, they spend a lot of energy making sure that Ziaur Rahman (or Maolana Bhashani or Tajuddin Ahmed or Fazlul Huq or HS Suhrawardy) are either demonised, villified or airbrushed. Its opponents aren’t any better. “Zia declared independence’ — that’s pretty much all BNP has to say, never mind the dead man’s politics of synthesis. At least AL spends energy playing down all the other dead leaders. I wonder if the average BNPwallah intellectual (never mind the supporters) is even aware of those historical figures. Had our history wars been about different concepts of nation or visions of society, I’d have relished the dialectics. But as things are, our history wars, and their combatants, are simply pathetic. Isn’t there fundamentally a fault line, though, on either side of which those two dead Bangladeshi leaders are symbols for a core group of people to rally around? The sycophancy of the day that encourages the focus on personalities (living or dead) may be to appease those currently at the helm, but say 30-40 years from now when there will be a difference in leadership, unless the fault line moves or blurs (as it has several times since 1947, most fundamentally in 1971), I think the core division will remain, just expressed in different ways – perhaps in a way that is not so destructive, or perhaps even more so. The comparison I’d draw is not with India (for a whole bunch of reasons) but with the US – not just because of the two party system but because of the core divide which is increasingly bitter (and personal) and masked by peripheral debates and posturing. There may be floating voters around the edges, but fundamentally there is some core ideology around one’s identity / central beliefs (even if based on flimsy understanding of declared personal positions) that pretty much define whether one is a Republican or a Democrat (or an Independent). And now it’s being expressed in an increasingly shrill environment. Hmm. Comparison with the US is an interesting idea. But my tentative (because as much as we all love to follow American soap opera politics, it’s not something I have thought about deeply) take would be somewhat different from what you imply. To this outsider, American politics seems to be characterised by the narcissism of small differences. To me, it seems that both the major parties actually agree on the substantive issues of policy, which is all about maintaining the welfare-warfare state. Precisely because of that agreement on the core issues, the parties need to posture and polarise on ‘culture wars’ and ‘personality’ issues. Perhaps it’s the same in Bangladesh. Perhaps there isn’t any fundamental fault line. If there was one, the comparison with India would have been relevant. But perhaps Bangladeshis actually agree on the substantive issues, and the parties are really about, say, patronage. Perhaps that’s why there are shrill history wars about who stood on which stage on what day in March 1971.